The 28.15 metre motor yacht Hunny Bunny has had a central agency change and is now listed for sale by Ed Dickinson and David Seal at Northrop & Johnson. Built in GRP by UK yard Sunseeker International, Hunny Bunny was delivered in 2013 as a Sunseeker 28M model and was refitted in 2016. Her dramatic interior in satin-finished oak can accommodate up to eight guests in four cabins consisting of a full-beam master suite with a dressing room, a VIP suite, a double and a twin convertible to a further double, all with entertainment systems, television screens and en-suite bathroom facilities. 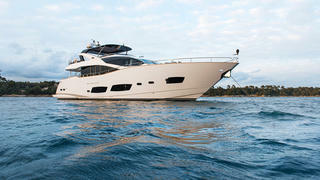 There are also quarters for four crew aboard this yacht for sale. The main saloon is elegantly decorated with fine joinery and polished chrome fittings, offering comfortable settees to port and starboard, armchairs, custom coffee tables and a dining area, plus a hydraulic sea balcony on the starboard side. A Platinum Package from the yard means that the air conditioning has been upgraded to tropical standards and three generators have been installed. The aft deck is well equipped for al fresco dining, with built-in upholstered seating, a dining table and concealed stereo speakers. Up on the flybridge there is a bar, electric barbecue grill, Jacuzzi, ice maker and a state-of-the-art entertainment system, all sheltered by a custom carbon fibre hard top. Twin 1,950hp MTU diesel engines power her to speeds of up to 29 knots and she is fitted with Trac digital fin zero-speed stabilisers. Lying in Croatia, Hunny Bunny is asking £3,495,000.